The IBM® Hardware Management Console (HMC) provides systems administrators a tool for planning, deploying, and managing IBM Power Systems™ servers. 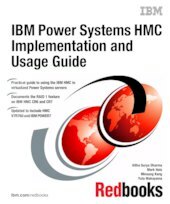 This IBM Redbooks® publication is designed for system administrators to use as a desk-side reference when managing partition-capable IBM Power Systems servers by using the HMC. In addition, there is an explanation on how to use the new HMC graphical user interface and the new HMC commands that are available with HMC Version 7, Release 7, modification 60.